A rumor claiming former White House Secretary Jay Carney is in the running to head up public relations at Apple —thought to have been put to bed last week —was resurrected on Saturday, with a new report saying he is still considering the position. In a report citing a friend of Carney's, Bloomberg claims the former press secretary has indeed talked with Apple over taking over former PR chief Katie Cotton's seat, but has not yet decided on the matter. When the publication reached out for comment, Carney was cagey about his future job prospects and declined to clear up the Apple rumor. "I'm talking to a lot of different people about a variety of potential opportunities," he said. Last week, Re/Code reported that Carney was in talks to become Apple's next vice president of corporate communications, but the rumor was refuted the next day by well-connected journalist Jim Dalrymple, who said, "Nope. Tim Cook has never even met Jay Carney." It was reported in June that Apple CEO Tim Cook was personally on the hunt for "high-profile external candidates" to replace Cotton after the PR vet retired from the company in May. Speculation at the time pegged longtime Apple spokespeople Steve Dowling or Natalie Kerris as top candidates to fill the still-vacant position. 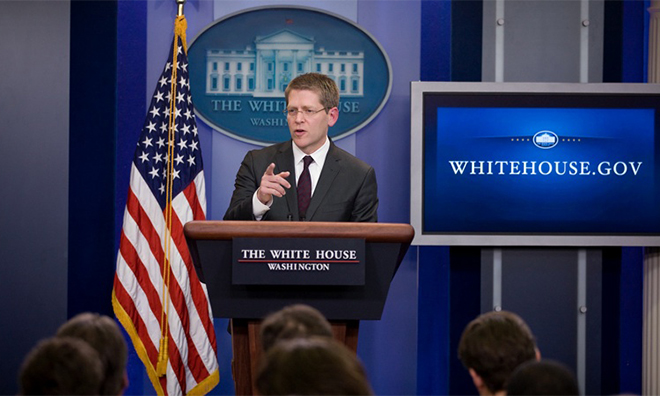 Carney, Time Magazine's former Washington bureau chief, stepped down as President Barack Obama's press secretary in June after three years in office. Prior to his time with Obama, Carney served as head of communications for Vice President Joe Biden.